The universe: evidence for evolution, or the handiwork of a Creator? A new study resolves the enigma! Is BELIEF in a living intelligent Creator unscientific? Is the scientific method the only way to view reality? The existence of a Creator is generally viewed by spokesmen for the scientific establishment as incompatible with objective reasoning and the scientific method. What guarantee, if there is a Creator, do we have that we are not dupes of "cosmic practical jokes" such as being placed in a young universe "created with an appearance of age"? Has that Someone gone to a lot of trouble to produce fossils, even with worn-down teeth and arthritic joints, in order to trick us humans into thinking we evolved? Would a superior Being continually meddle with the laws of nature, thereby confounding the results of scientific experiments and making such results meaningless? These questions demand answers. Modern science has made many amazing discoveries about our universe. These are nearly always presented to the layman in the language of evolution. But do these discoveries genuinely support evolution — or the opposite conclusion? Just what should we conclude from the evidence of scientific investigation? The origin of the universe has been debated by astronomers, physicists, philosophers and theologians for centuries. Has the universe always existed? Did it come into existence at some definite time in the past? Many theories — theological and scientific — have been proposed and then discarded as new discoveries were made. In recent times, one theory — the big bang theory — has come to be accepted by many scientists as more consistent with the data than any other. The big bang theory proposes that the entire universe exploded into existence in an instant of time. Physicists now claim to be able to project backward into the past to within one billion billion billion billionth of a second of the big bang (Science Digest, May 1981). Using known laws of physics, they theoretically tell what conditions would have been like within such a small time unit immediately after the big bang. To accept the big bang theory, one has to believe that the entire universe came into existence suddenly and dramatically in an infinitesimally microscopic moment of time. Does that sound like the slow, gradual unfolding of evolutionary processes? A few things bother scientists about the big bang theory. On the one hand, they observe inexplicable uniformity on the large scale, but, on the other hand, "c1umpiness" on the small scale. There is also something they call "flatness" of the universe that requires special initial conditions. Moreover, the occurrence of the big bang itself seems to violate known physical laws. In puzzling over these problems, scientists use expressions such as, "Someone had to time it very precisely," "The conditions of the universe were specially arranged," and "How did the universe manage to go 'bang' in such an improbable way?" (Science News, September 3, 1983). So, the origin of the universe could not possibly be the result of a cosmological pipe bomb that somehow produced itself and just blew up. Is there an explanation that agrees with the data? There is! The real big bang was a well-planned, deliberately executed act of CREATION! How would you expect a superpowerful divine Being to bring forth an entire universe? With a small fizzle, a limp thud or a weak whimper? Of course not! The creation of the universe was accomplished with a glorious display of light, heat, matter and energy — a display that still reverberates throughout space and only recently has been described by scientists as the big bang! Thousands of years ago David wrote: "The heavens declare the glory of God" (Ps. 19:1 ). The marvels known today — the incredible size and power of the stars, the enormity of galaxies, awesome phenomena such as supernovae, pulsars and quasars — tell us more about the glory of God than David could have ever imagined! How old is the universe? The answer to this question is almost always misunderstood by creationists and misused by evolutionists. Creationists generally believe, falsely, that the universe is hardly more than 6,000 years old. On the other hand, many evolutionists falsely suppose that the great antiquity of the universe somehow "proves" evolution. First of all, the Bible does not say the universe was created 6,000 years ago. It simply says, "In the beginning God created the heavens and the earth" (Gen. 1:1, Revised Authorized Version). The physical evidence shows a universe and earth of great age. At the Grand Canyon alone one can see with the naked eye the results of geological processes that would require immensely more than 6,000 years to complete. Further evidence from radiometric dating and astrophysics pushes the age of the universe back to more than ten billion years — or ten thousand million years for our British readers. Evolutionists seize on these millions of years out of necessity. After all, they believe that given enough time, anything can happen. Apparently, some creationists also believe that given enough time, evolution could happen. Otherwise, why would they so desperately attempt to squeeze the history of the universe into a few thousand years in spite of stubborn facts to the contrary? Both viewpoints are wrong! Necessity does not prove anything. You need air to fly an airplane. Just because you have air, that doesn't mean you automatically have an airplane without the need of a designer. In the same way, just because you have billions of years, that does not make evolution occur. The great age of the universe does not in itself "prove" evolution or creation. But what does the age of the universe tell us? Why would a Creator make it so long ago and maintain it? Not only merely to "declare his glory," but for an astounding purpose! The Creator is eternal. He inhabits eternity (Isa. 57:15). What better way to teach temporary human beings something of the concept of eternity, than to put them into a universe that is millions upon millions of years old? The earth teems with millions of forms of life — animals and plants of many distinct characteristics. Do these life forms give evidence for evolution? 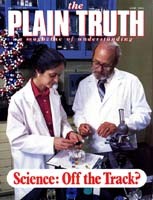 In two previous articles in The Plain Truth (September 1981 - THIS PHYSICAL LIFE...Did It Begin by Chance?, U.S. edition; February 1983 - EVOLUTIONISTS and CREATIONISTS Are at It Again! & Is PHYSICAL LIFE the Result of BLIND CHANCE?, all English language editions), we have shown the utter mathematical improbability of even the "simplest" components of life, let alone life forms, coming into existence and developing through evolution. Mutations and natural selection notwithstanding, there is no evidence that life "evolved" — the missing links are still missing. But life does teach us something about the Creator, something very important, which neither evolutionists nor theologians understand — something fundamental about God's plan! Evolution requires major changes in already existing life forms by means of natural genetic reproductive processes. (That is, invertebrate to vertebrate: fish to amphibian to reptile to bird, monkey to ape and hominid, and hominid to man.) There is not one shred of proof in the fossil record that genetic changes of this magnitude have occurred — or are even remotely possible — by any known biological process. A careful study of the anatomy and behavior of numerous creatures clearly shows how preposterous such an idea actually is. Kind reproduces its own kind! Only the creative process could account for the geologic record and the contemporary world. But the fact of reproduction after its own kind also contradicts the teaching of nearly all theologians about the purpose of God. Would it make any sense for a living intelligent supreme Being to try to thwart legitimate scientific inquiry by "monkeying around" with the laws of nature? Would a Creator use cosmological trickery to deceive human beings about the creation they inhabit? The real Creator does not operate that way! "The Lord by wisdom hath founded the earth; by understanding hath he established the heavens" (Prov. 3:19). "These six things doth the Lord hate: yea, seven are an abomination unto him.... A false witness that speaketh lies..." (Prov. 6:16, 19). The Creator would not create a universe or even a planet earth that was itself a false witness. That would hardly "declare his glory" and "show his handiwork" (Ps. 19:1). Does that mean the Creator never intervenes? It's very much like an airplane with an automatic pilot. The automatic pilot maintains the direction, speed and altitude of the airplane. However, the human pilot can override the automatic pilot at any time. What we call laws of nature are like the automatic pilot. The Creator does on rare and usually unique occasions decide to override the "automatic pilot." But there was only one parting of the Red Sea. If the Red Sea parted every full moon, we would certainly expect to find a physical explanation, not a supernatural one. Spectacular divine interventions are unique and do not permanently alter the "laws of nature." Similarly, miracles that affect an individual, such as a divine healing or an inexplicable protection from serious bodily injury, involve only a temporary or momentary alteration or cessation of existing physical, chemical or biological laws. As more scientific discoveries are made, whether at the galactic level or the subatomic level, there is only more evidence of law, design, harmony and order — more evidence of an intelligent, ever-living, superpowerful Creator! "For the invisible things of him from the creation of the world are clearly seen, being understood by the things that are made, even his eternal power and Godhead; so that they are without excuse" (Rom. 1:20). So the next time you read about the wonders of nature or watch a television program describing some fascinating scientific discovery, don't be misled by evolutionary terminology and bias. Realize that you are seeing the handiwork of a master Creator!